1.1 Thank you for taking the time to read our terms and conditions (terms, conditions). This website (www.cammellshoney.co.nz) is operated by Cammell's Honey Ltd (we, us) with the purpose of providing an on-line shopping service via which customers can purchase goods (honey, pollen and related products) from us. 1.2 You should read and ensure you understand these terms before making an order through this website. If you do not agree with any of these terms you must not order goods through the website. 2.1 Cammell's Honey Ltd. reserves the right to amend these terms at any time. Amendments will be effective immediately upon being placed on the Website. Your continued use of this site following such amendments being placed on this website will represent an agreement by you to be bound by the new terms as amended; including a complete change of these terms. 3.2 It is your responsibility to ensure that the details provided to Cammell’s Honey Ltd when creating a login profile are correct and kept up to date. 3.3 You may order goods as described on this website for the price specified. Cammell's Honey Ltd is a New Zealand based business. All prices are expressed in New Zealand dollars and are inclusive of goods and services tax(GST). 3.4 Price lists, products and product availability are subject to change without notice. While we will do our best to ensure your order is met, we provide no warranty as to the availability of Goods ordered on this website. In the event payment is made for an unavailable product, we will refund the purchase price of that product in full. 3.5 Any special prices, discounts, deals or other changes in price shall apply to the relevant goods or orders only for as long as the products remain available for sale or for the duration of the promotion. We reserve the right to limit sales of any products. 3.6 Payment is to be made prior to the dispatch of your order via internet banking or with a credit/debit card through our secure hosted payment page. We retain the right to remove payment options at any time and for any reason; as such at any given time a certain payment option may not be available. 4.1 You may cancel an order by calling us on 09-275-6457 or e-mailing us at sales@cammellshoney.co.nz up to the point of dispatch, once dispatched an order may not be cancelled. 4.2 We reserve the right to reject your order for any reason. In the even of an order being rejected, neither you or we will be under any further obligation to the other arising out of your Order or our rejection of that Order. We will undertake to reimburse you for any payments already received by us in the even of a rejected order. 5.1 It is your responsibilty to ensure that the delivery address you have provided is correct. In the event that you are not home to collect delivery it is your responsibility to arrange delivery or pick up from the freight forwarder. 5.2 You may specify in the special instructions or order comments an authority to leave. If authority to leave is granted; we and our forwarding agent will not be held liable for undelivered parcels. 5.3 We and our chosen freight forwarder (courier) will undertake to deliver goods ordered to the address specified within the estimated delivery time frame stated on your order confirmation. However, we do not guarentee we will do so. We do not accept liability, whether for direct, indirect or consequential loss or damage, arising due to any delay in delivery of the goods or any failure to deliver the good ordered by you for whatever reason. 5.4 It is Your responsibility to check the quantity, quality and description of the goods delivered against the details on the delivery slip. If there is any difference in quantity, quality or description of the goods delivered, you must notify us at sales@cammellshoney.co.nz within seven working days from the time of delivery. If notice is not given within seven working days, the goods you recieved shall be deemed to have been accepted and you shall not be entitled to make any claim or take any action in regards to any alleged deficiency or irregularity in the goods after that time. 6.1 Ownership of the Goods does not pass to you until payment has been received in full by Cammell's Honey Ltd. The risk in the goods purchased will pass to you upon delivery to a carrier commissioned by us to deliver the goods. 7.1 Incorrect orders must be reported to Cammells Honey Ltd within seven working days of receipt together with the invoice number. Any goods returned must be in the same condition as they were recieved. 8.1 Authorisation from Cammell's Honey is required before returning any goods ordered in excess of your requirements or in error. Cammell's Honey Ltd. is under no obligation to grant any such authorisation. 9.1 As per clause 5.4, you have seven working days to inform us of the receipt of any damaged or defective goods. If the damage or defect is deemed to have been caused by Cammell's Honey Ltd. or our carrier, we will either replace the damaged/defective item or provide a refund of the purchase price. We will also pay any reasonable cost incurred for the return of the items. 10.1 In the event that we agree to the return of any goods for a refund, we will notify you of the appropriate procedure to be complied with to return the goods. Refunds will be paid within ten working days of our receipt of returned goods. 11.1 You acknowledge that you have made your own investigations as to whether or not the goods purchased meet the requirements that you have for them. 12.1 Notification of any damage or discrecpancy in the order delivered must be made within two working days of the time of delivery to Cammell's Honey Ltd. If notification is not made, Cammell's Honey Ltd will not be liable for any damage or discrepancy. 12.2 If goods are are not delivered, Cammell's Honey will not be liable unless you notify us within ten days after confirmation of dispatch. 13.1 You acknowledge that Cammell’s Honey Ltd. will send e-mails in regards to orders and that it is the customer’s responsibility to read the e-mails and take such actions as required. 15.2 Cammell’s Honey Ltd. will not send any communication beyond that which relates to a customer’s order unless expressly advised to do so. Such communication includes new product information, news-letters or special offers. Should a customer wish to stop receiving such information they may unsubscribe from these services. 14.1 Subject to the relevant provisions of the Consumer Guarantees Act 1993. We exclude all other express or implied terms, conditions, warranties, representations or endorsements whatsoever with regard to the goods, this website or any information or service provided through this website. 14.2 The Consumer Guarantees Act 1993 does not apply in cases where you are using the website, or purchasing goods for a business purpose. 14.3 We accept no liability for any loss whatsoever including loss, be it direct or indirect, suffered by you arising from good/s we have supplied to the extent allowed by law. 15.1 In the event any act orcircumstance over which we could not reasonably have exercised control interferes with our ability to comply with these conditions, we may terminate this agreement. 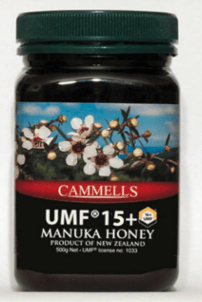 16.1 Cammell's Honey Ltd. is based in New Zealand and as such is subject to the laws of New Zealand. The Terms and conditions outlined on the page cannot surpass your rights under the applicable laws relating to this site or the purchase of goods from this site. 17.1 Your visit to our website, is bound by a limited licence to access and use our information for your own personal use. 17.2 Although we will make our best effort, we can't guarantee that our website will operate continuously or without interruptions or be error free and can accept no liability for its unavailability or for any errors it may contain. 17.3 You must ensure that you have taked precautions regarding the process which you employ for accessing this site, and/or downloading any information from this site, does not lead to infection from viruses and/or other code that has contaminating or destructive properties that could damage or intefere with your computer, telecommunication equipment or any other property. We do not accept responsibilty or liability for any damage or inteference caused to the above mentioned property in connection to your use of this site or any site linked to from this site. 17.4 You may not violate the security of the website or those of our service providers or attempt to gain unauthorized access to the website or content, computer systems or server through hacking, password mining or any other means. 18.1 Links provided from this website are done for your convenience only and we take no responsibility for the content and maintenance of, or privacy compliance by any linked website. Our links to other sites do not infer our support, endorsement or owner of the linked site or of the imformation and/or goods provided on the linked site. 18.2 You may link to our website only with our express consent. If you link to our site you do so at your own responsibilty and expense. 19.1 Unless otherwise stated, Cammell's Honey Ltd. is the owner of, or has the right/licence to use all trademarks, copyrights and intellectual property on this site. The copyright to the layout, images, graphics, text and any other content on this site is either owned by us, or we have the right via license to use them. 19.3 Accessing this website or related websites does not license you to use copyrighted/trademarked material or any content belonging to Cammell's Honey Ltd in any commercial way without our prior written consent. 19.4 You may not use or attempt to use any automated device, code, process, program, tool, methodology or similar manual process to access, acquire or copy any portion of the website its content. 19.5 You may not use any code or hidden text or other means which incorporate our name or any of our intellectual property including trademarks without our express prior permission. 20.1 Any comments, feedback, suggestions, testimonials or ideas submitted to us via our website or via become our property. By posting to our site or contacting us via our site you agree that we are entitled to use your comments for any commercial or non-commercial purpose without compensation to you or to any other person who has transmitted your comments. 20.2 We will remove at your request any comments, feedback, suggestions or testimonials that you have made within 3 working days. 20.3 We reserve the right to; not allow the posting of any post, to edit any specific post, or remove any post at any time and without explanation or prior notice. 21.1 While we promise to take all due care with any information which you may provide to us when accessing our website; no data transfer over the internet can be guarenteed to bee completely secure. Therefor, information provided to us via this website is done so completely at you own risk.